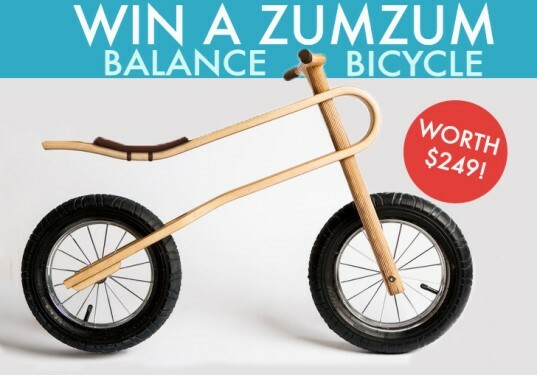 The ZumZum all-terrain balance bike is the coolest bike around for kids, with an ergonomic seat and natural suspension for safe and fun riding experience. We are offering you a chance to win one for your little tot just for following our Inhabitot’s Pinterest page. Click on the link below to read the rules and get your kiddo one seriously sweet ride. The contest ends TOMORROW, January 31st at 11:59PM! The ZumZum all-terrain balance bike is the coolest bike around for kids, with an ergonomic seat and natural suspension for safe and fun riding experience. We are offering you a chance to win one for your little tot just for following our Inhabitot's Pinterest page. Click on the link below to read the rules and get your kiddo one seriously sweet ride. The contest ends TOMORROW, January 31st at 11:59PM!